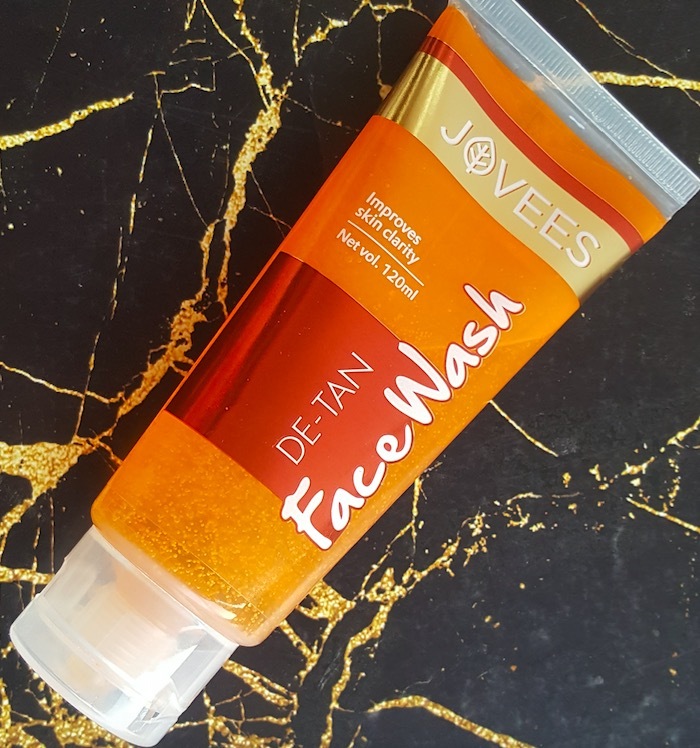 Hey everyone, today I’m sharing the review of the Jovees De-Tan face wash that I’ve been using for past two weeks. It claims to be an excellent recipe for removing tanning and dark spots that occur due to various environmental factors. 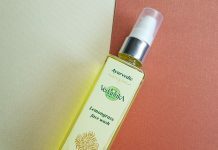 It also claims to help in improving skin clarity, leaving skin soft, smooth and visibly fairer. It is produced scientifically to ensure each ingredient used does not lose its properties during the processes. Price & Availability: The price of the Jovees De-Tan Face wash is Rs.95 for 50ml and Rs.175 for 120ml. It is easily available at local beauty stores and also at leading online shopping websites or you can buy it from Jovees’s official website Jovees.com. 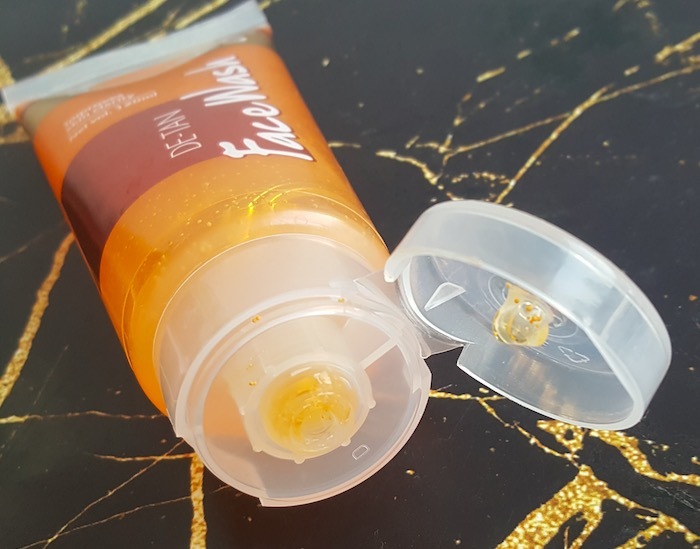 Packaging: Jovees De-Tan face wash comes in tinted yellow squeeze tube with clear plastic cap. The cap is tightly secure and there is no fear of leakage in case you want to carry it along while traveling. The product related information is also mentioned on the tube. Overall The packaging is sturdy, hygienic to use and travel-friendly. 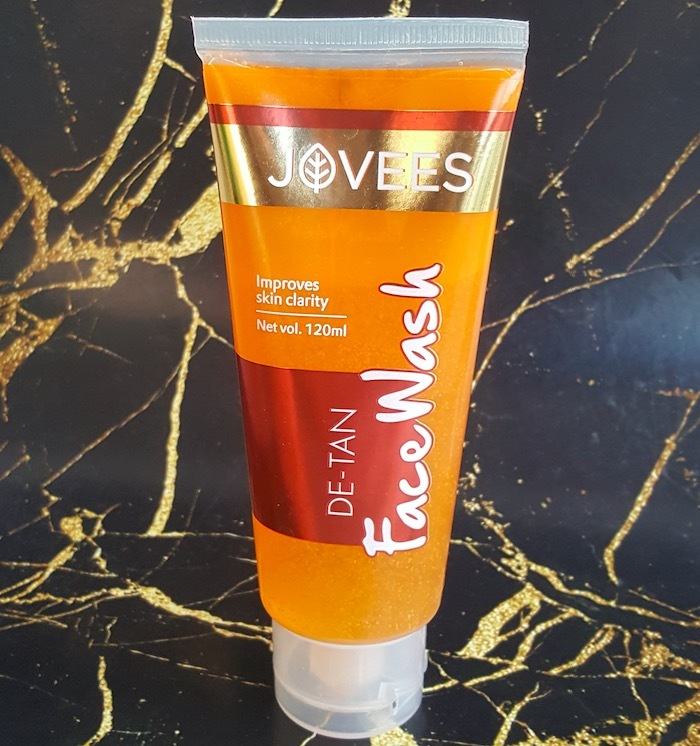 Texture & Fragrance: Jovees De-Tan Face wash comes in a light yellow color and contains loads of orange color beads. 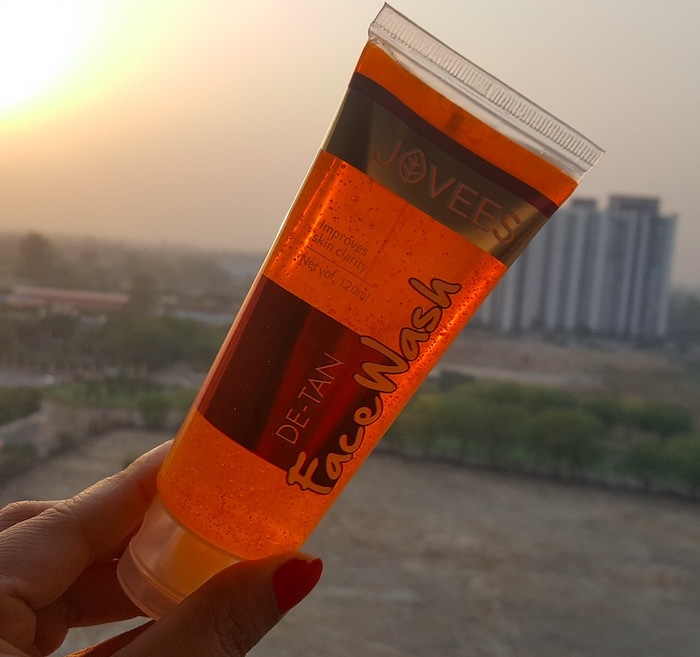 It is a gel based face cleanser and comes with a mild fragrance. Its consistency is neither too thick nor runny. My Experience: I have a combination skin which is easily prone to acne and blemishes. Especially during the summers no matter how much I protect my skin using sunscreens, my skin does get tanned very often. So I keep using tan removal products (face wash, face pack, facials, etc.) during the summers. Currently, I’m using the Plum Chamomile & White Tea Tan Buster face scrub and face pack and really liking them. 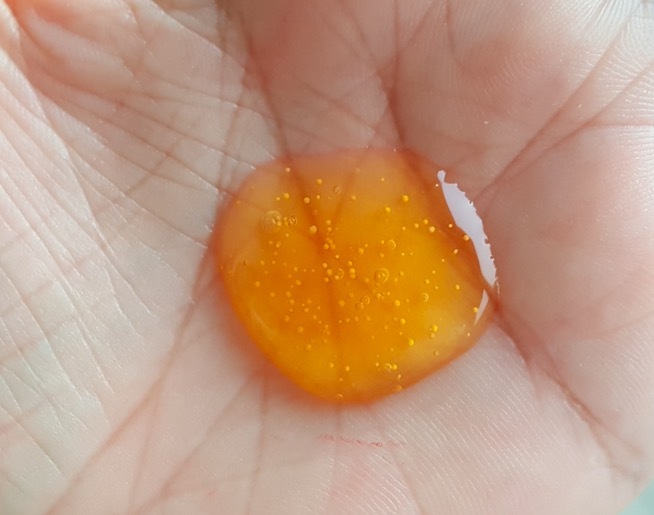 I squeeze out the gel face wash on my palm and add some water to make a froth. Then I massage it nicely on my wet face and neck. 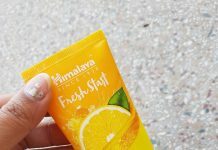 It lathers nicely and removes impurities and oil from the skin nicely. Also, the round shaped beads help in exfoliating the dead skin cells. You need to put a little extra effort to wash it off otherwise it can leave a sticky feeling behind. 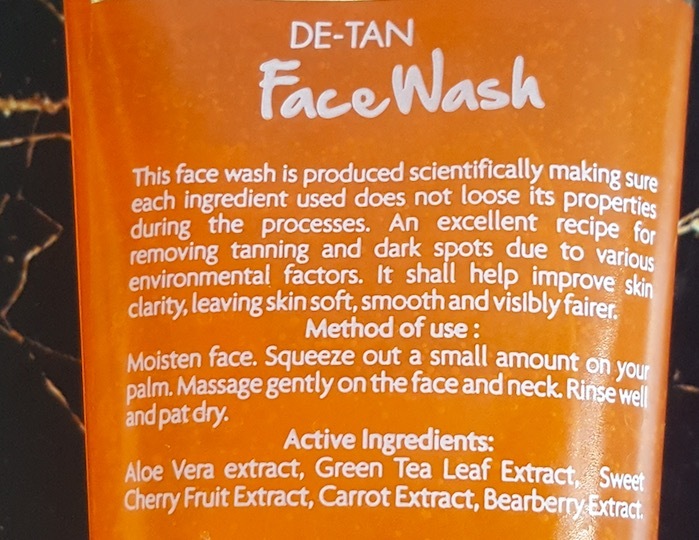 After pat drying my face feels soft, clean and I can notice a mild glow after every wash.
I’ve been using this face wash for the last 2 weeks and it did a decent job in reducing the tan I was having. It does reduce tan but not in a one use, you need to be patient to see visible results. When used regularly for some time it will help improve your skin’s appearance. A gel-based face wash that removes impurities leaving the skin clean, clear and moisturized. It contains tiny beads that help exfoliate the skin. 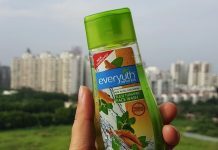 It is enriched with aloe vera, green tea, cherry and bearberry extracts. It does help reduce tan when used regularly over a period of time. It didn’t cause any breakout to my acne prone skin. Affordable and the quantity provided for its price is pretty good. Full ingredients list in not provided on the tube. It doesn’t give a squeaky clean feel to the skin, so people with oily skin might not like it. It is not very effective in fading away dark spots neither does it reduce severe tan. Disclaimer: The product was sent by the brand for review purposes. However, my review is unbiased. 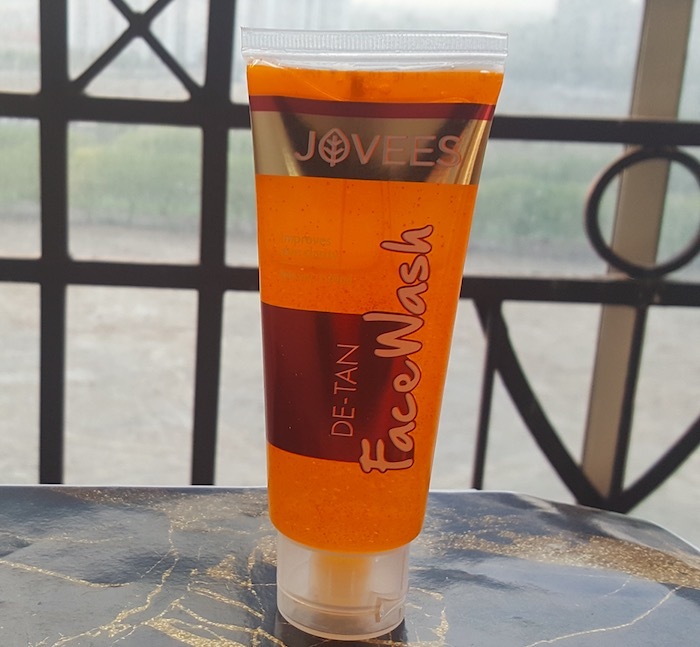 Overall, Jovees De-Tan face wash cleanses well, leaving the skin clean, moisturized and mildly glowing. It does make skin clear by reducing tan but you need to use it daily over a period of time to see visible results. If you are suffering from a mild tan and you don't want to spend a huge amount then you can check this out. Recommended!